Reserve Online By Clicking Here & Go To Reservations. Hamptonites and those who long for the flavors of summer by the sea rejoice! 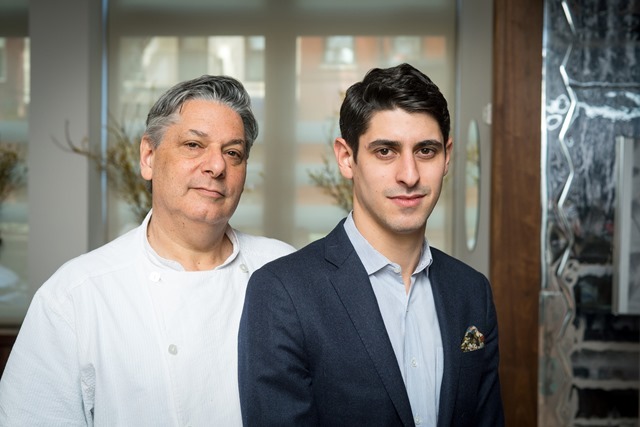 Dynamic father-and-son team and co-owners Eric and Adam Miller transported their popular seasonal sea-to-table concept Bay Kitchen Bar from East Hampton to Manhattan’s Upper East Side with Partner Richard Silver. Located in the space that formerly housed Hospoda, the new outpost gives New Yorkers a chance to experience Miller’s cuisine year round. BKB is the latest project from the Millers, who couldn’t wait for the Hamptons to come back to life this spring. “We were lucky to be embraced by the local community our first season. 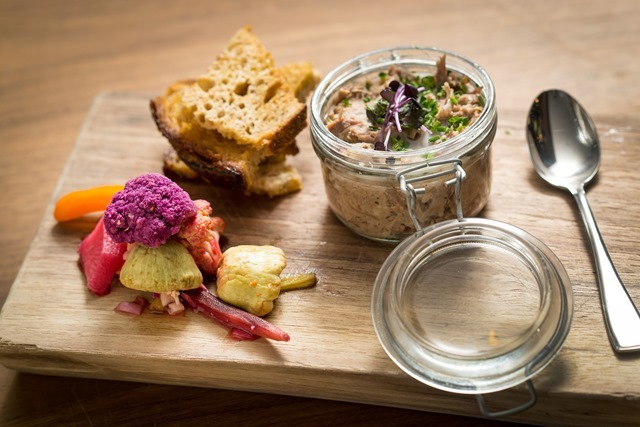 When an opportunity to take over the restaurant space at Bohemian National Hall came along, we couldn’t resist the temptation to see our guests again, plus introduce our cuisine to a whole new audience here in the city,” says Chef-Owner Eric Miller. Like the East Hampton original, this restaurant will serve inspired cocktails and the best seafood and meats that local East Coast suppliers have to offer. For a Long Island native like Eric Miller, sea and farm-to-table is not a new trend, but a way of life, having built relationships with local sources over the past 30 years as a chef. With an emphasis on high quality ingredients and clean Mediterranean preparations, everything is expertly chosen to provide the freshest and best selection for his guests. Crafting menu that blends favorites from Bay Kitchen Bar with some new seasonal additions, BKB’s crave-worthy Snacks like Fresh Jumbo Lump Crab Cake; Slow Cooked Short Ribs; seasonal Poached Asparagus with Seasonal Vegetables and crispy Montauk Pearl Oysters, are all great new options , for a light bite alongside drinks. Plentiful Raw Bar selections like fresh and fabulous Eastern Oysters; Little Neck Clams; and marinated fresh fish salads made with Scallops, Harbor Fluke or Yellowfin Tuna are also offered to whet the appetite. 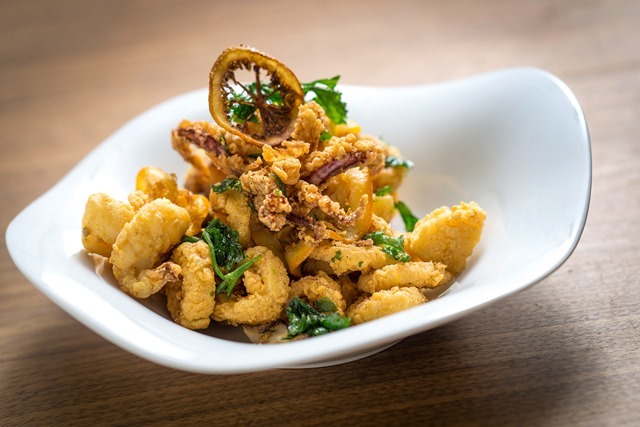 First Course options ooze with comfort, from Miller’s signature Fisherman’s Soup; to Chickpea Crusted Fritto Misto that is the best I’ve had since Italy; and Braised and Seared Octopus with tomato-vegetable ragout, couscous and herbs that would do any Greek mama proud. Seafood entrées of pan roasted fish and lobster rolls star on the Second Course menu alongside turf from the rotisserie and grill. Highlights include Bay Kitchen Bar’s signature Day Boat Sea Scallops, accompanied by a new spring blend of farro piccolo-grain salad and refreshing Champagne vinaigrette; and Mustard & Herb Crusted North Atlantic Tuna with a new basil potato & roasted peach cipollini glaze finish; while East Hampton Harbor Fluke with Sicilian capers, herbs, orzo and rainbow chard is a welcome new addition rounding out the offerings and is destined to become the signature dish. Poultry lovers will delight in Miller’s Roasted Herb-Stuffed Organic Chicken; and Slow-Turned Long Island Duck with wilted greens & dried cherries. The BKB Burger with aged cheddar, caramelized onions and special sauce; and BKB Hand-Shucked Lobster Roll have returned from the original menu for a more casual meal on a bun. Poultry lovers will delight in Miller’s Roasted Herb-Stuffed Chicken; and Slow-Turned Long Island Duck with roasted golden potato, wilted greens & dried cherries. The Black Angus Sirloin Cheeseburger and BKB Hand-Shucked Lobster Roll have returned from the original menu for a more casual meal on a bun. Finishing on a sweet note, desserts are prepared by Pastry Chef Lukas Pohl. 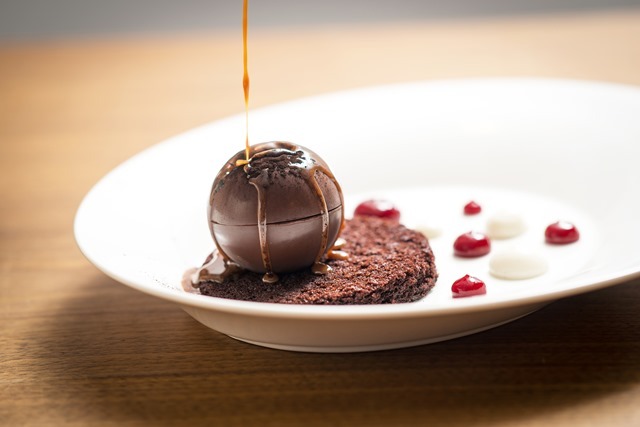 Czech-born Lukas is a decorated pastry chef hailing from Prague’s Michelin-starred restaurant La Degustation Bohême Bourgeoisie, and most recently Hospoda. A student of the Culinary Institute of America, Lukas was also a pastry instructor at prestigious Czech cooking institutes for years. BKB’s dessert offerings include a Crème Brûlée Trio that mashes up flavor pairings from espresso & cookie to matcha & raspberries; the signature Dark Chocolate Black Forest Bombe presented with a sidecar of warm salted caramel that is ceremoniously poured over to melt the bombe open and reveal sweet cherry jelly inside; to a comforting Czech dish of Warm Strudel; and seasonal Summer Berry Rhubarb Crumble, all accompanied by house made ice cream and sorbets. A selection of dessert wines, Toby Estate coffees and teas by In Pursuit of Tea are offered to pair with dessert. Partner and General Manager Adam Miller, a graduate of the wine program at the International Culinary Center, reprises his role overseeing operations and the dining room. Having worked alongside his father as Director of Operations at Madison and Main in 2013, he came along for the ride at Bay Kitchen Bar last year as a full-fledged partner. There, Adam put his creative talents to work co-designing the space and overseeing the dining room. He developed a reputation for showering guests with his unique brand of irresistible charm, welcoming them with a smile and making sure service hums. With a natural eye for design, Adam studied fashion and interior design at Pratt Institute, after which he founded home goods brand Waverly & Irving. Adam’s passion for fine spirits and wine lead him to curate an extensive list of spirits, which will delight connoisseurs of whiskey, rum and tequila alike. He also assembled an all-star team to collaborate on BKB’s beverage program, offering inventive cocktails and carefully curated wine & beer lists to accompany Eric Miller’s cuisine. The Millers are thrilled to welcome mixologist Maura McGuigan as their Beverage Director for this new venture. Maura comes with an impressive résumé under her belt, having been the first female Head Bartender at Chicago’s The Violet Hour, as well as Chef de Bar at Daniel Boulud’s Bar Pleiades and General Manager at Booker and Dax here in New York. She was also the “woman on the ground” for Death & Co. founders David Kaplan and Alex Day at The Rose in Jackson Hole. The cocktails at BKB meld all the techniques and tools Maura has been acquiring in her arsenal over the past eight years. “Expect to have elegantly crafted vintage and modern classics as well as a seasonally changing menu of creative originals that will take cues from the cuisine,” says McGuigan. 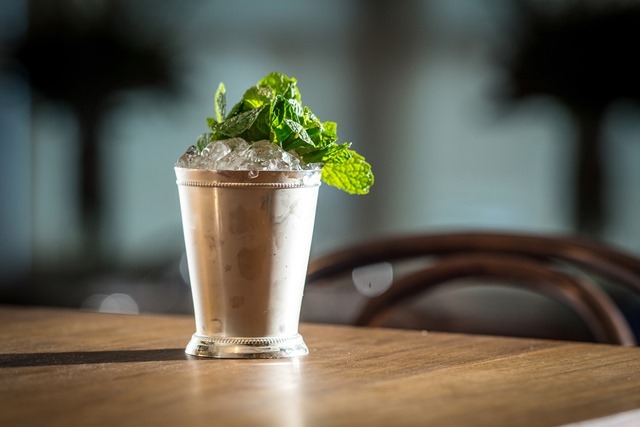 Signature cocktails range from the Dime-Store Diplomat, made with Four Roses Bourbon, muddled clementine & lemon, Assam tea and aromatic bitters, to the Beaumont Club, Prairie Organic vodka, Angostura bitters, orgeat, lime and egg whites. A wide and sophisticated selection of beers by the bottle and draft are also prominently featured, including Cricket Hill Brewery’s East Coast Lager. Reappearing from Bay Kitchen Bar is Eric Heine, serving as Wine Director at BKB. He is on hand to help guests navigate through the restaurant’s wine offerings and perfectly complement their meal. Certified by the Court of Master Sommeliers, Eric has an extensive knowledge of wine, beer, and liquor. He has traveled through winemaking regions in South America, Canada and the west coast of the US, where he explored the wines of Washington, Oregon and California. He is passionate about European-style winemaking, which mandates tighter control over the soil, grapes and consistency of the wines, and is gaining popularity outside of Europe. The cherry-picked wine list at BKB is focused on small producer wines that are characteristic of their regional terroir. It includes a variety of bottles under $100 as well as a global selection by the glass to pair with the menu. In true Hamptons fashion, each night kicks off with $1 Oyster Happy Hour from 5-7pm in the bar, including $5 Muscadet by the glass. We loved the wine list with lots of options under $50 and Mr. Heine’s expert advice, sans attitude. Adam also brings Designer Scott Rominger to the team, a Pratt Institute friend with a degree in Architecture. A talented designer with a modern aesthetic, Rominger served as project manager for Rafael de Cárdenas’ firm Architecture at Large and worked on projects for Leong Leong before designing the original Bay Kitchen Bar interiors. He was called on again to reimagine the new space, as well as the restaurant’s visual elements from graphic design to social media. The Millers tasked Scott with transforming the mood of the room in just one month’s time. BKB’s ambiance echos the easy elegance and tranquility of the East Hampton original, but incorporates more upscale and modern muted tones with urban stainless steel touches. 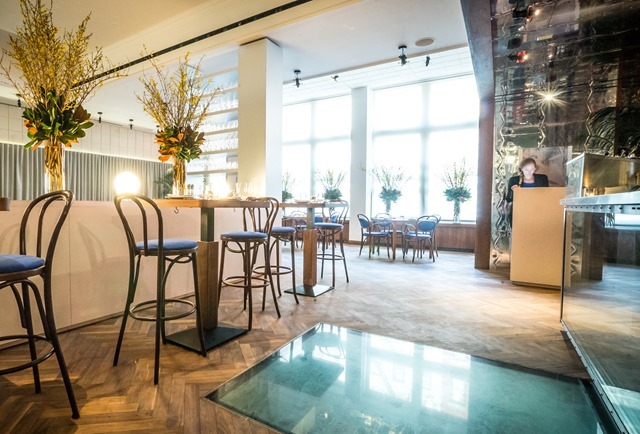 The space has been thoughtfully renovated to retain some of the existing elements such as the walnut herringbone flooring, custom made furniture and see-through glass bar. The dining room has been cleared of communal picnic tables and filled with more intimate two and four tops. 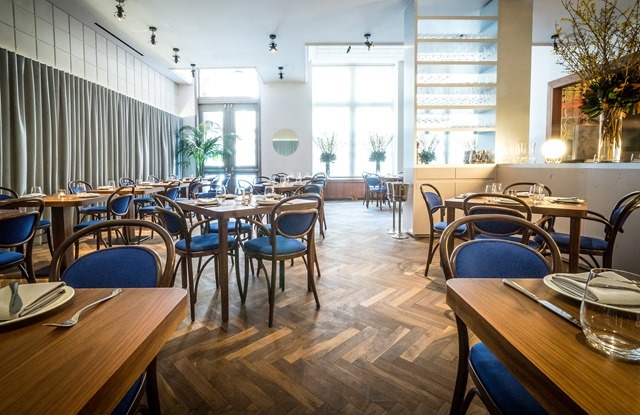 To provide guests with a comfortable dining experience, Thonet-style bentwood chairs upholstered in rich cobalt blue fabric hint at the maritime-focused menu, while the walls have been covered with textured fabric panels to both add warmth and reduce sound from New York’s noisy streets. A new low partition was added, creating a separate bar & lounge area as well as providing a central service station for efficiency. The overall atmosphere provides a modern yet comfortable experience that is on par with the cuisine. The 1,430 sq. ft. space seats 44 for dinner and to accommodate walk-ins, a more casual 12-seat bar & lounge area with a prime view of the bartender in action shaking up signature concoctions. There is also a private dining space for up to 8 guests tucked away, and an open kitchen on the lower level. 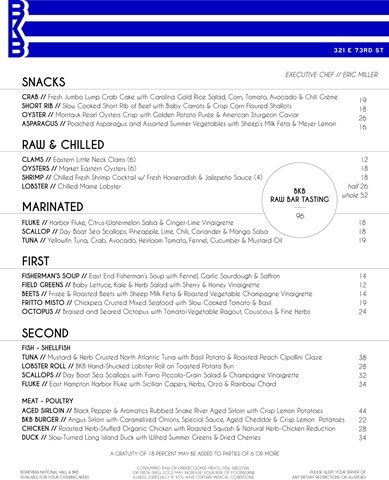 BKB is open for dinner seven days a week, from 5-10pm weeknights and 5-11pm on weekends. 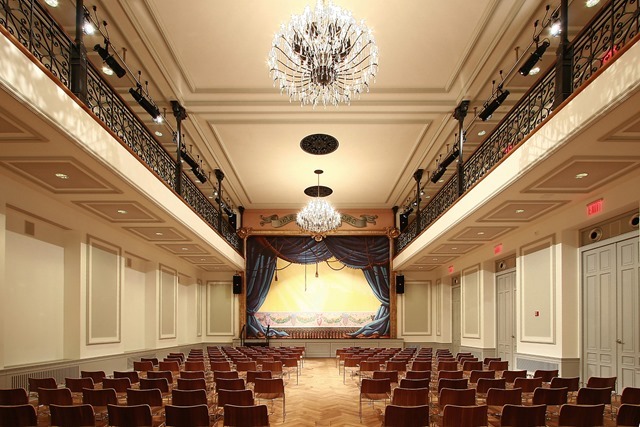 The restaurant and Bohemian National Hall are both perfect venues for special occasions and private events of all sizes. 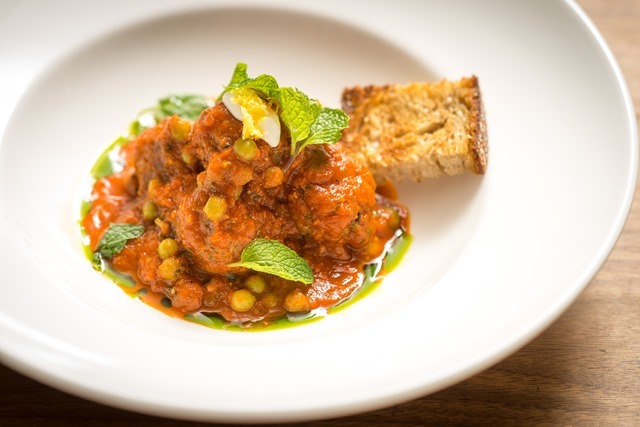 For event inquiries, please call 212-861-1038 or contact Jacqueline Le Borne jaci@foodandco.com. Let’s hope NYC will begin to offer more restaurants like BKB wonderful food, bar, wine, service and gentle prices. What more can you ask for. Well . . . I wish it were in my neighborhood.